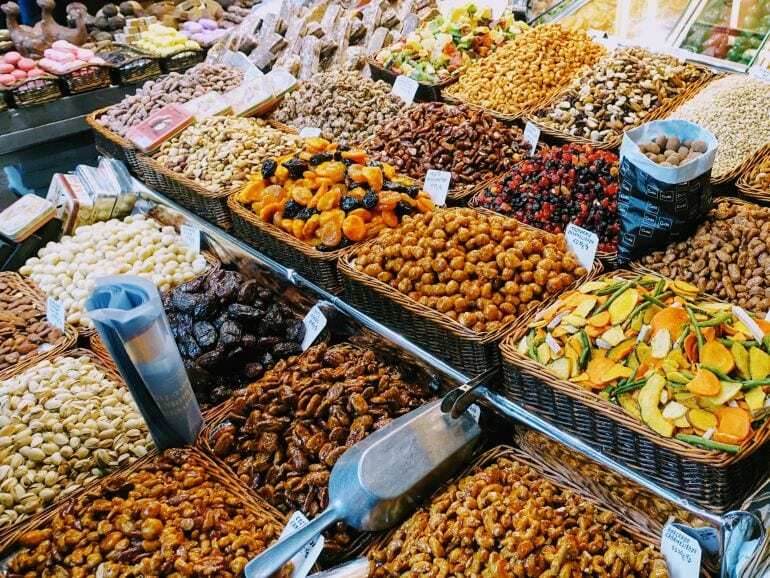 Join us on our Barcelona Market to Tapas tour as we take a gastronomic journey from the market to the table. Starting at the source, we taste our way through a local Barcelona market and hear the history of the markets in Barcelona and why they are still Barcelona’s favorite food fairs. Wander the old streets of the Gothic and Born neighborhoods as we indulge in the local epicurean tastes & traditions of some classic Spanish dishes. Your gourmet guide will share the history of Barcelona’s ancient streets and buildings, as we wander through 2 neighborhoods eating and drinking over a leisurely 3 hour tour. In Barcelona “market to table” is called KM0 and our historical market tour is a fantastic example of this philosophy. Here we will enjoy a selection of some unique Spanish olives, all with different flavour profiles – so there is something for everyone to enjoy! We also visit the best cheese stand in the market to taste the artisanal produce. If you love French cheese, prepare to fall in love all over again, with our mixed sampling of delicious goat, sheep and cow cheese. No visit to Spain would be complete without learning about Jamon Iberico and the different types produced. You’ll hear all about the production techniques and how it should be served. You’ll get to eat some beautiful 3-5 year old Jamon Iberico de Bellota and you’ll also have the opportunity to buy some of the local produce we see, as we walk among the market stalls. From here we have a short stroll into one of the best preserved Gothic neighborhood’s in the world. With a mix of history starting from the Roman times, we take in the art and architecture on our way to indulge in the best chocolate and churros in the city. Our protected former city farm is a gem in itself, having been built into the 4th century Roman wall. 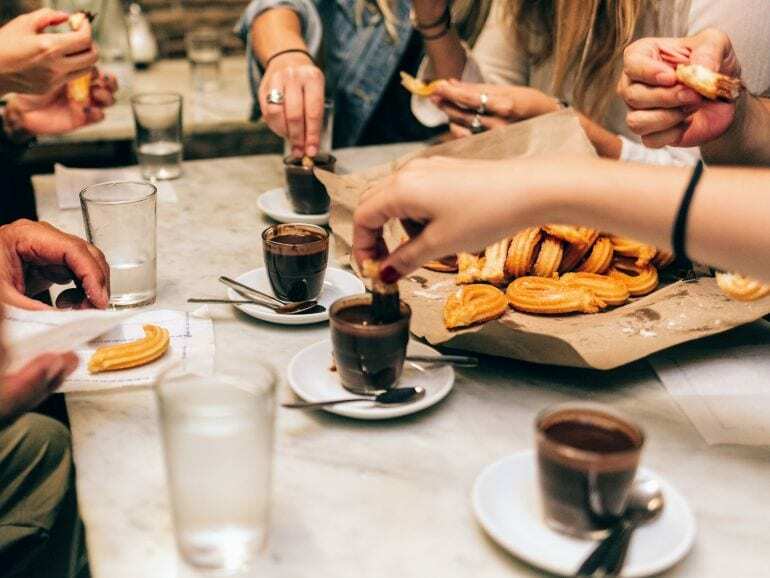 You’ll get to hear the history about the origins of chocolate in Spain and some surprising facts on churros as your try the thick local chocolate. Our third stop is a locally-loved bar a few steps away in the Gothic area. 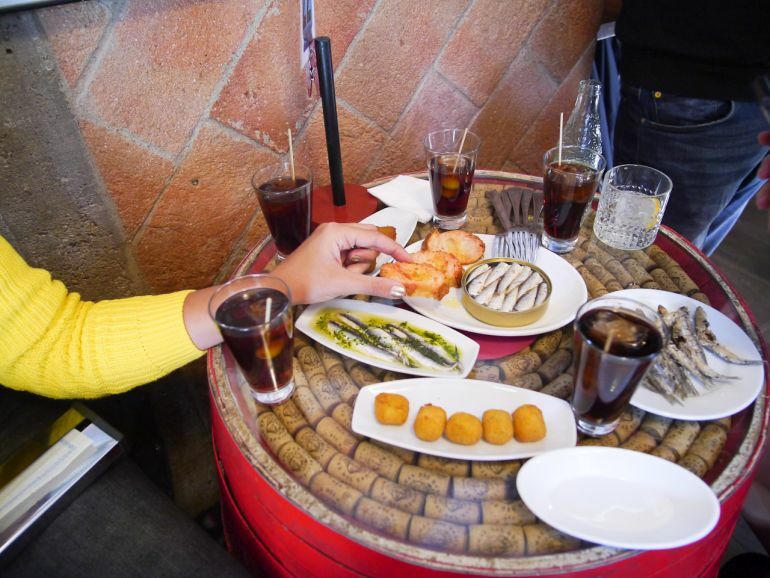 Here we taste some local drinks and typical tapas dishes as your guide gives an insiders guide to the local food. 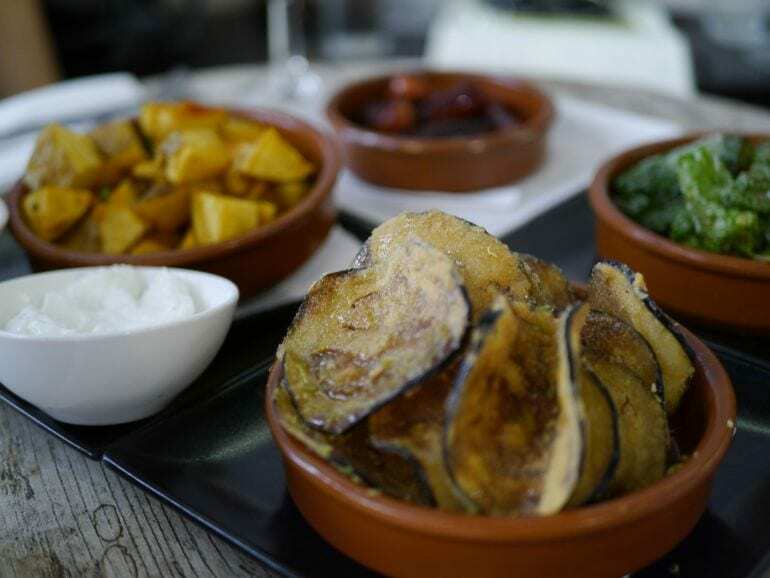 Before long it’s time to wander over to the artesanal neighborhood of El Born, where we finish our experience in a charming restaurant to indulge in a delicious lunch of Spanish tapas & Catalan dishes, washed down with a beautiful Spanish wine. 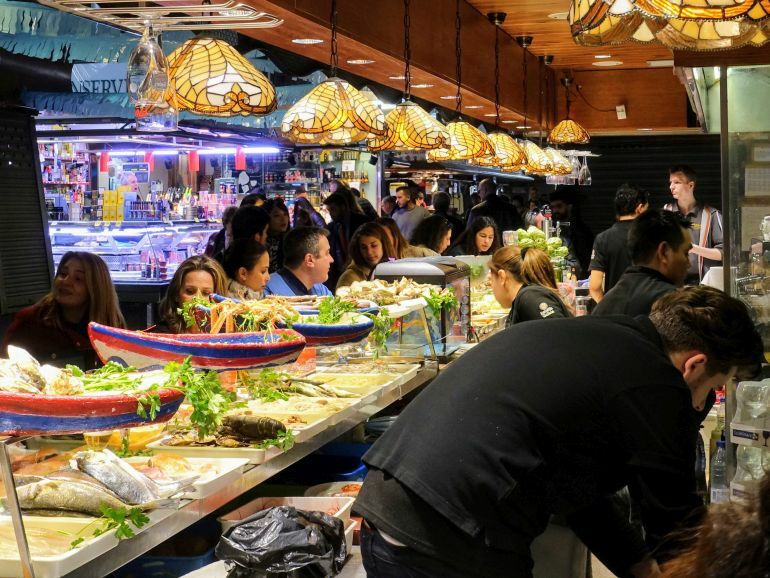 Throughout your Barcelona Market To Tapas experience, we’ll share insightful stories about the origin of the dishes and drinks, as well as the history, culture and traditions of the city. It’s a fun way to learn, eat and indulge on your visit to beautiful Barcelona. Join us on our Barcelona Market to Tapas tour as we take a gastronomic journey from the market to the table. 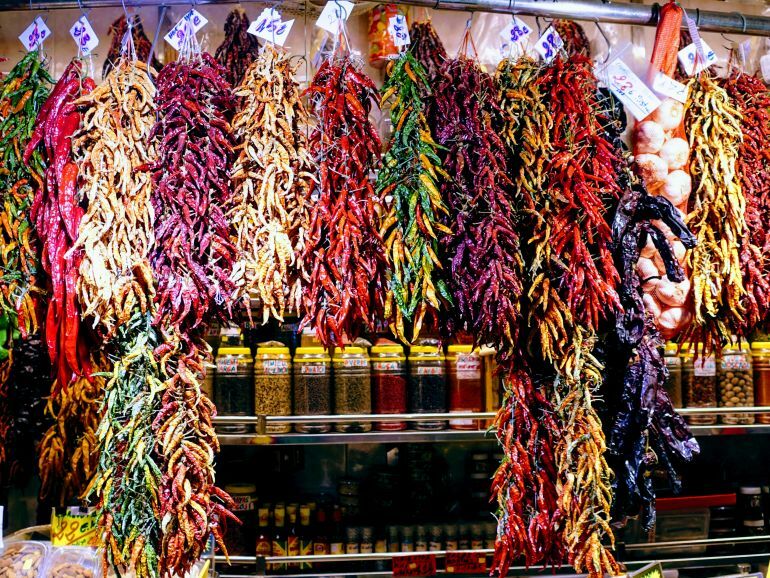 Starting at the source, we taste our way through a local Barcelona market and hear the history of the markets in Barcelona and why they are still Barcelona’s favorite food fairs. Wander the old streets of the Gothic and Born neighborhoods as we indulge in the local epicurean tastes & traditions of some classic Spanish dishes. Your gourmet guide will share the history of Barcelona’s ancient streets and buildings as we wander through 2 neighborhoods eating and drinking over a leisurely 3 hour tour. Our price includes all food and drinks (wine, cider, non-alcoholic) along the walk and Spanish 21% IVA tax. Our tours operate at 11.00am* on Monday, Wednesday & Saturday. *Private tours can be arranged outside these days & times. Visit a local Barcelona market, a reformed city farm, a bodega & local restaurant, where you indulge in the many tastes and dishes of Spain. We cater for most dietary restrictions. You will be losing out if you do not book a tour with these folks when you visit Barcelona. Thank you so much for the wonderful time! Do not miss this food tour, I promise its so much more than a food tour. You will learn history from locals, drink and eat things you never would have and just have the best day! !